It's that time of year again when our garden needs compost, and like last year, for smaller loads the bakfiets proved itself a handy solution. I got a couple of loads of mushroom compost today in under an hour and a half, including all travel time, loading and unloading onto the garden. An improvement on last year's effort was the judicious use of the gumboots to pack it down firmly in the box, meaning that I was able to get more than 80KG of compost in a single load, up from 60KG last year. One thing I really like about using the bakfiets instead of a car trailer for this job is that there is no back-straining shovelling and twisting. 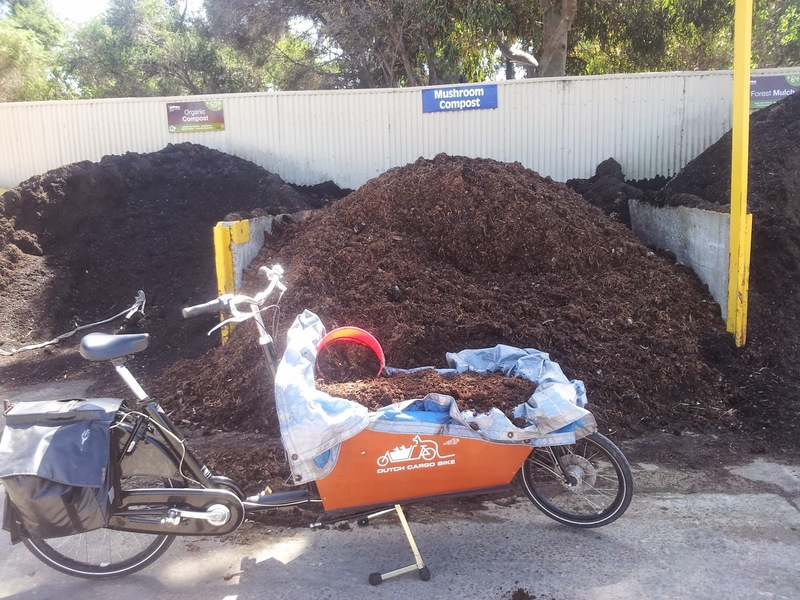 You can just park the bakfiets near the garden bed in question, just like a wheel-barrow, and bucket the compost out comfortably until there is sufficiently little that you can just lift out the remainder and tip it on the garden.